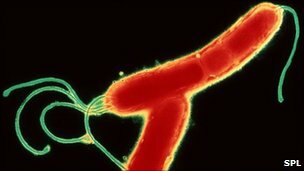 The bacteria responsible for stomach ulcers have been linked to Parkinson's disease, according to researchers in the US. Mice infected with Helicobacter pylori (pictured) went onto develop Parkinson's like symptoms. The study, presented at a meeting of the American Society for Microbiology, argues that infection could play "a significant role". The charity Parkinson's UK said the results should be treated with caution. Parkinson's disease affects the brain and results in slow movements and a tremor. Middle-aged mice, the equivalent of being between 55 and 65 in humans, were infected. Six months later they showed symptoms related to Parkinson's, such as reduced movement and decreased levels of a chemical, dopamine, in the brain. These changes were not noticed in younger mice. Dr Traci Testerman, from the Louisiana State University Health Sciences Center, said: "Our findings suggest that H. pylori infection could play a significant role in the development of Parkinson's disease in humans. "The results were far more dramatic in aged mice than in young mice, demonstrating that normal ageing increases susceptibility to Parkinsonian changes in mice, as is seen in humans." The researchers believe the bacteria are producing chemicals which are toxic to the brain. They said H. pylori was able to "steal" cholesterol from the body and process it by adding a sugar group. Dr Testerman said this new chemical was almost identical to one found in seeds from the cycad plant, which had been shown to trigger a Parkinson's-like disease among people in Guam. She told the BBC: "H. pylori eradication in late stage Parkinson's disease is unlikely to result in significant improvement. "Certain neurons are killed before symptoms begin, and more are killed as the disease progresses. Those neurons will not grow back." Dr Kieran Breen, director of research at Parkinson's UK, said: "We believe Parkinson's is most likely caused by a combination of environmental factors together with an individual's genetic susceptibility to developing the condition. He said there was some evidence that bacteria can prevent the main drug to treat Parkinson's, levodopa, being absorbed, but there was no strong evidence that people who have H. pylori in their gut are actually more likely to develop Parkinson's. He added: "The current study is interesting and suggests that the bacteria may release a toxin that could kill nerve cells. "However, the results should be treated with caution. The research was carried out in mice that were infected with relatively high doses of the bacterium or its extract. "While they developed movement problems, we don't know whether this was actually due to the death of nerve cells. Further research needs to be carried out".